Process simulation software is a software or tool that provides designing and modeling capabilities to oil & gas plants, pipelines, and other major equipment. These designing tools help project managers, site engineers, as well as site laborers to clearly understand the product/ operation in a virtualized environment which eventually helps them in designing the plant, pipeline, etc. as per requirement. The software helps oil and gas companies to minimize the risk of error and optimize total cost of production. 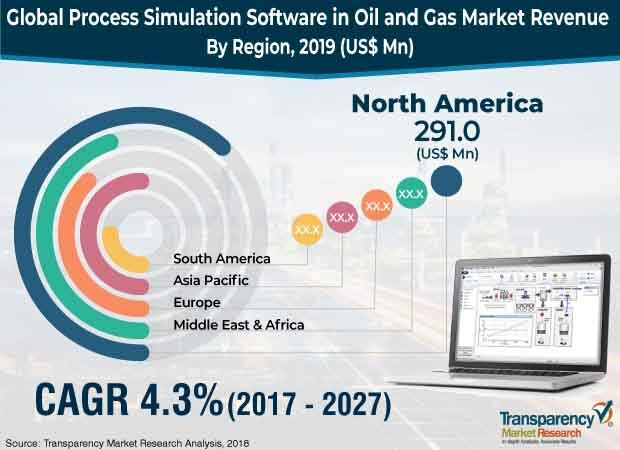 The global process simulation software in oil and gas market was valued at US$927.7 Mn in 2018. It is anticipated to expand at a CAGR of 4.3% during the forecast period. Software segment is expected to dominate the market throughout the forecast period. Growing implementation of process simulation software at oil and gas facilities to efficiently design and analyze each process during exploration and production of oil and gas is a crucial factor which is boosting the growth of the process simulation software in oil and gas market globally. Oil and gas industry is witnessing tremendous transformation due to industry 4.0. Oil and gas companies are therefore realigning investment by focusing on operational efficiencies and by investing in latest technologies. One such prominent technology is virtual reality/ augmented reality. This factor is expected to provide new opportunities for the growth of the market during the forecast period. In terms of application, the upstream, oil & gas processing, and refinery segments constituted a prominent share in the market. Modeling solutions help engineers and contractors to efficiently model and design any kind of infrastructure in minimal time and cost, which reduces the overall time of the project. Midstream, petrochemicals, and green engineering application segments are anticipated to expand at a substantial growth rate during the forecast period. The use of HSE system at oil and gas plants can reduce accidents and increase efficiency. The global process simulation software in oil and gas market is primarily driven by increasing drilling activities globally and rising overall IT expenditure by oil and gas companies. Furthermore, rising adoption of cloud-based solutions is also driving the growth of the process simulation software in oil and gas market around the globe. Cloud-based solutions help oil and gas companies in increasing the life span, uptime, and reliability of their plant infrastructure, which eventually increases return on investment (ROI). Growing investment in AR/ VR based 3D simulation tools/solution is one of the major factors which is likely to create new opportunities for the growth of the process simulation software in oil and gas market during the forecast period. Oil and gas companies are expected to increasingly use AR/ VR to fix and maintain equipment at oil and gas facilities, train engineers and other staff, and efficiently visualize underground assets and pipelines to avoid any type of breaks during digging. The adoption rate of process simulation software in oil & gas market in developed regions such as Europe and North America are estimated to increase substantially in the next few years. In terms of revenue, North America accounts for the largest share in the global process simulation software in oil and gas market. Growing digitalization and rapid technology adoption are the major trends contributing to the growth of the process simulation software in oil & gas market in the region. Asia Pacific is anticipated to witness lucrative growth in the process simulation software in oil and gas market during the forecast period. The Asia Pacific market in the short run is largely driven by increasing drilling activity in China. In the long run, countries such as India, Indonesia, Australia, Vietnam, and Malaysia are expected to drive the market. The global process simulation software in oil & gas market includes different players such as Aspen Technology, Inc., Honeywell Process Solutions, KBC (Yokogawa), AVEVA Group Plc, Process System Enterprise, Ltd., Chemstations, Inc., Kongsberg Gruppen, GSE Systems, Inc., Virtual Material Group Inc. (Schlumberger), ProSim, EQ-Comp, Schneider Electric SE, and Bryan Research & Engineering, LLC. Companies in the oil and gas industry have now realized the importance of technology and the strong positive impact that it brings in optimizing the overall operation process. Therefore, the oil and gas industry is significantly embracing and adopting connected technology and analytics technology in order to efficiently manage their operations. This report by Transparency Market Research provides insights to how the ecosystem has evolved over the forecast period spanning a term of ten years, viz. from 2017-2027. Right from adoption analysis of process simulation softwareat oil and gas facilities, the report ensures that a holistic approach for market analysis is adhered to, enabling stakeholders to make informed strategic decisions. The demand estimates of the process simulation software in the oil and gas industry market have been broadly analyzed by segmenting it on the basis of application, component, and operation type. Based on application, the market has been segmented into upstream, midstream, oil and gas processing, refining, petrochemical, and green engineering. Upstream application is further categorized into flow assurance, fluid properties, production facilities equipment design and analysis and gathering system. Midstream application is further categorized into storage, pipeline integrity, flow dynamics, flow assurance (metering & economics), network analysis & optimization, and pipeline design and analysis & pipeline equipment. Oil and gas processing application is further segmented into oil and gas separation, sulfur recovery, sweetening, CO2 freezing, liquefaction, dehydration, and cryogenic processes. Refining application is bifurcated into crude oil distillation and heavy oil processing. Green engineering is further segregated into HSE system and flaring. In terms of component, the market is segmented into software, and services. Software segment is further categorized into cloud-based and on-premise. Services segment is categorized into consultancy, training, and support. Based on operation type, the market is segmented into onshore, off-shore, heavy oil processing, and unconventional. The above detailed analysis of market size estimates has been provided for the following geographic segments North America, Europe, Asia Pacific (APAC), Middle East & Africa (MEA), and South America. Across each of these regions, top-line market estimates for the U.S., Canada, U.K, Germany, France, China, India, Japan, Australia, GCC, South Africa, Mexico, and Brazil has been included within the research scope. To further support market analysis and help build deep understanding of growth dynamics, the report provides the following analyses - macro-economic factors analysis, Porter’s Five Forces Analysis, technology roadmap, value chain analysis, market attractiveness analysis, application mapping, and competition matrix providing matrix of competitive positioning of key players as per select parameters. The market sizing methodology adopted involved a multi-pronged approach, ultimately resulting in data being triangulated from all models/approaches. Primary focus has been on analyzing information as retrieved through the primary approach which required interaction with industry experts. These included professionals across companies involved at various stages of the ecosystem/supply chain. Data heads such as technology adoption and penetration trends, total number of oil and gas companies globally, adoption rate of process simulation software in oil and gas industry, pricing analysis, capital expenditure trends, technology hurdles, and outlookwere some of the key parameters modelled based on inputs received. These were simultaneously also verified against information collected through different secondary sources. Major sources include company annual reports, analyst briefings, technology white papers, industry magazines/publications, expert blogs, and paid secondary databases. Apart from data aggregated from these models, the data is also verified from the data available in- house repository and expert panel opinion. The analysis included in the report has been developed based on a study of key performance parameters of companies active across the ecosystem, with process simulation software providers making up the majority of the list. Some of the players/companies which were subsequently profiled and included in the final report draft include Aspen Technology, Inc., Honeywell Process Solutions, KBC (Yokogawa), AVEVA Group Plc, Process System Enterprise, Ltd., Chemstations, Inc., Kongsberg Gruppen, GSE Systems, Inc., Virtual Material Group Inc. (Schlumberger), ProSim, EQ-Comp, Schneider Electric SE, and Bryan Research & Engineering, LLC.